Had the best practice this morning. Ashtanga rest day so switched to Vinyasa Krama and practiced the Bow and Meditative sequences with some inversions followed by Pranayama and Japa mantra meditation. Caught my heels for the first time in six weeks in Kapo too and really nice pranayama. Interesting, this is my first long Vinyasa Krama practice in about six weeks, what with the month long, led primary with Sharath project. I've practiced a shorter VK and pranayama practice in the evenings but even this was interrupted by the tictac project, so nice to have a proper practice. I've missed it. Ashtanga is great, love it, enjoy it, feel fitter and stronger, the detox aspect seems to work but somehow, the last week or two I can't help feeling that I've moved on, Ashtanga's no longer enough. This is no criticism of Ashtanga, it's a vary personal reaction but somehow the pranayama, the meditation, the chanting, my whole attitude to anything 'yogic' seem to marry better with Vinyasa Krama. Perhaps it's just because I began to explore those areas while practicing Vinyasa Krama and associate them with it or maybe it's just that I'm too hot and sweaty after Ashtanga practice and don't like sitting on a sweaty Equa towel for pranayama. I know, I could change, and switch towels but it's more than that, somehow Vinyasa Krama practice seems to flow into pranayama, the longer slower breathing of that approach to asana perhaps. Could be why some Ashtangi's practice pranayama before their practice. Ramaswami taught that the asana reduces the Raja's, the agitation, restlessness, then you practice pranayama to reduce tamas (eg. lethargy), setting you up perfectly, putting you at your most satvic, for your meditative practice. And It makes sense to me, the asana, pranayama, pratyahara all there to prepare you for a more effective meditation practice, to create the best conditions for concentration. Ashtanga is great for dealing with rajas but does it really put me in the best state for a concentrated, focussed meditation practice? For falling asleep in savasana perhaps but not for meditation. At least not me. But then of course the argument is that Ashtanga combines everything, it is the meditation practice. there's something else though, I don't know how else to put it. Ashtanga seems to dominate my practice, my day, I feel less relaxed, less calm, less.... equanimous. But that's OK it's been an excellent six weeks, sharpened up my primary, had a good detox. I figure I'll just think of Vinyasa Krama as my 3rd series. Practice Primary on Fridays, 2nd series on Sunday ( for the detox and to keep my hand in) and Vinyasa Krama the rest of the week. I might still take a month of led 2nd to tidy it up, August perhaps. So still going to practice Ashtanga and my even my Vinyasa Krama practice has a kind of loose Ashtanga structure to it, Standing, main body, finishing etc. Also I want to spend June/July shadowing Ramaswami's Vinyasa krama TT course. I have all my notes and have been wanting to revisit them, so when the course starts in LA I'll do the same asana here at home as I did last year and reread and chant the yoga sutras, Krishnamacharya's Makaranda etc, the pranayama and meditation and perhaps post on it. Here are the details of Ramaswami's VK TT course, can't recommend it enough and if you want a second opinion here's Claudia, a card carrying Ashtangi on Ramaswami's 20 hour Yoga Sutra course last week. Clic on the title below for the link and if you have any questions regarding the course feel free to contact me, email address is under contact me in the About me profile section of the blog. The 200-Hour Vinyasa Krama Yoga Teacher Training program, which is registered with Yoga Alliance®, is open to those seeking intense study in the Traditional Yoga as learned from the legendary Yogi Sri T. Krishnamacharya. Upon completion in the program, participants are eligible for Yoga Alliance® RYT® or E-RYTSM certification. This 200-hour program, under the direction of Srivatsa Ramaswami, will impart a comprehensive and in-depth grounding to Traditional Yoga as learned from Krishnamacharya. In the complete Vinyasa Krama series, the entire range of sequences, numbering about 700 with important pranayama, chanting and meditation methods taught by Krishnamacharya, will be explored. Srivatsa Ramaswami is Krishnamacharya's longest-standing student outside the family. He has mastered Vinyasa Krama, Vedic Chanting, and Yoga Therapy. He is a registered Yoga Teacher with the Yoga Alliance at the E-RYT500 (500 hour) level. This is the highest level of certification the Yoga Alliance offers. 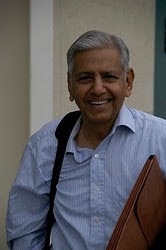 He has studied the classic Yoga texts extensively and has written countless articles, recorded more than 35 cassettes of Sanskrit mantra, and has written two books: Yoga for the Three Stages of Life and Krishnamacharya's Vinyasa Yoga. 6 Weeks Loyola Marymount Univ. This teacher training program runs six consecutive weeks in the Summer. Classes meet in the morning, afternoon and evening daily. Schedules and tuition are subject to change. Additional fees may be incurred for housing, books and materials. Please check the Web site for updates. Submit an enrollment form for the program via direct mail, or contact LMU Extension at 310.338.1971 to handle your enrollment over the phone. You can also register for courses individually online. Following the guidelines outlined by Yoga Alliance® for registered 200-hour teacher training programs, this program qualifies participants to register for the 200-hour credential, as verified by Srivatsa Ramaswami. This teacher training program may not be applied towards a Yoga Philosophy certificate. Shared housing is available for a limited number of students during the program. Students will be staying the Tendrich Apartments on the LMU campus for 41 nights. The cost of housing (separate from tuition and related fees) is $1,845. Students will be assigned two (2) to a room; four (4) to a two-room apartment. Please contact us directly to make arrangements: 310-338-2799 or email yoga@lmu.edu. Housing is limited and only open to those who have already registered for the program. Housing is assigned on a first come, first serve basis. The next cohort begins Monday, June 6, 2011. Students enrolling in the teacher training are invited to attend a program orientation the evening of Sunday, June 5 prior to the start of class (schedule is listed below). Students must make sure they are enrolled in 200-Hour Teacher Training (YGPX 900.01), which automatically enrolls in the student in the required courses necessary for the 200 hours. Please contact the Center with any questions at 310.338.2358. Students who do not intend to pursue the 200-Hour Teacher Training are welcome to enroll in one or more of the courses below for their own personal enrichment. Otherwise, students pursuing the teacher training must enroll in 200-Hour Teacher Training (YGPX 900.01) as listed above. Srivatsa Ramaswami is Krishnamacharya's longest-standing student outside the family. He has mastered Vinyasa Krama, Vedic Chanting, and Yoga Therapy. He has studied the classic Yoga texts extensively and has written countless articles, recorded more than 35 cassettes of Sanskrit mantra, and has written two books: Yoga for the Three Stages of Life and Krishnamacarya's Vinyasa Yoga.